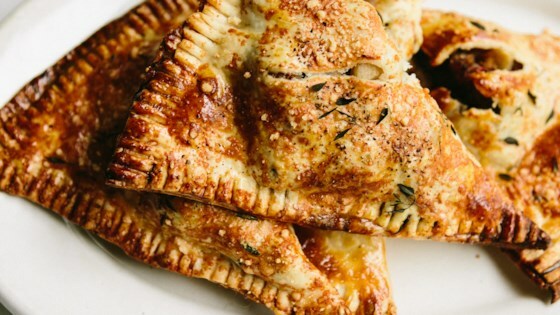 "Make these savory hand pies the day before and pop in the oven to serve. Serve warm or at room temperature." Heat a large skillet over medium heat. Add sausage; cook, breaking meat apart with a wooden spoon, until browned, about 5 minutes. Add apple; cook and stir until starting to soften, 2 to 3 minutes. Season with salt. Let filling stand until cooled, at least 15 minutes. Beat egg and egg yolk together in a small bowl to make egg wash.
Preheat oven to 450 degrees F (230 degrees C). Line 2 baking sheets with parchment paper. Unroll pastries onto a lightly floured work surface. Spread and gently press 1 tablespoon Parmesan cheese and 1/2 teaspoon thyme over each pastry. Slice each pastry crosswise into 4 wedges. Add a generous 1/4 cup filling to each wedge. Brush edges with egg wash. Fold dough over the filling and seal the pies. Crimp edges with a fork and trim any excess dough. Arrange pies on the prepared baking sheets. Brush with any remaining egg wash; sprinkle the remaining 2 tablespoons Parmesan cheese and 1 teaspoon thyme over pies. Season with pepper. Bake in the preheated oven until golden brown, rotating pans halfway through, 12 to 15 minutes. Let cool before serving, about 10 minutes. Refrigerate filling to expedite cooling process. I used puff pastry and put pepper into the mince /apple mixture. I have made it several times, changing ingredients after the first go - like onion. I would add extra apple for a better sweet and savory balance. My husband suggested trying puff pastry next time. No changes and will make it lots of times .I found it just what the Doctor ordered . Easy to make! I doubled the recipe so the kids could take these to school.